584 pages | 228 B/W Illus. "Memorializing much of standard actuarial practice, as well as introducing some more advanced topics, Pricing General Insurance provides comprehensive coverage of the core techniques currently used in the insurance market. Its treatment of actuarial methods within a real-world business context of different lines of insurance, types of insurer, and types of coverage, as well as the regulatory environment, makes it especially relevant and helpful to practicing actuaries today." "Effective pricing is key to the success of any non-life insurer, and there are relatively few comprehensive works on this subject. Pietro Parodi’s work covers a very wide range of topics, from the introductory to the more advanced, and is thus a very welcome addition to the material available to students and practitioners alike." 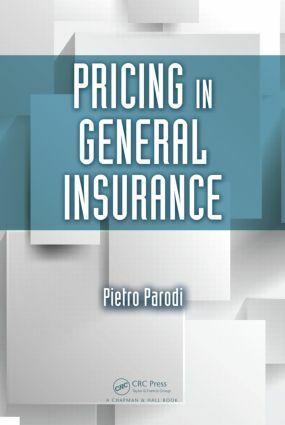 "The book is plentiful in real-world examples across the diverse world of general insurance, with a particular focus on a topic that is hard to find in the literature: how to price if the data are scarce. Separate chapters cover specific lines of business and the peculiarities of reinsurance pricing. However, standard methods like GLMs and credibility are covered as well. A must-have book for pricing actuaries." "An essential resource for anyone calling themselves a pricing actuary in general insurance or wishing to do so in the future. Read it from beginning to end, and you go on a journey from pricing basics to the latest techniques in the industry. Read a particular chapter when you need to, and you can confirm the detail of that particular area and how it applies to your work. The book covers not only the mathematics, but also the theory of the market, the products, and how to bring it all together; not only for insurance, but also the rather specialised world of reinsurance too. It is fantastic to finally have this all in one place, in one book. When I read it, I felt like someone had emptied my whole brain, ordered it, filled in the gaps, developed ideas further, and then written it all down with style, clarity, and humour. Brilliant! I plan for this book to be at my side for a long while to come." What Is This Thing Called Modelling? Pietro Parodi, Ph.D, FIA is a director at Swiss Re and a part-time lecturer at Cass Business School, both in London, UK. Previously he worked as an actuary at Willis Ltd., London, UK and Genoa, Italy, and at Aon Benfield, London, UK. He served as research/post-doctoral fellow at the International School for Advanced Studies, Trieste, Italy; University of Toronto, Ontario, Canada; and GE Global Research, Schenectady, New York, USA. His notable paper, Triangle-Free Reserving - A Non-Traditional Framework for Estimating Reserves and Reserve Uncertainty, was presented at GIRO 2012 and received the Brian Hey Award.